This morning before work, I happened to see Sebastian running across the front of the tank.... WITHOUT A SHELL! immediately I knew something was wrong and I needed to get him back into a shell. So I gently scooped him into a cup, added a shell, and put a towel on top. Within minutes he was back into a shell!! But I realized he's missing his big pincher and a couple legs... Someone must have been fighting last night while I was asleep! So I put him in a small ISO tote, similar to the ones I used to move. 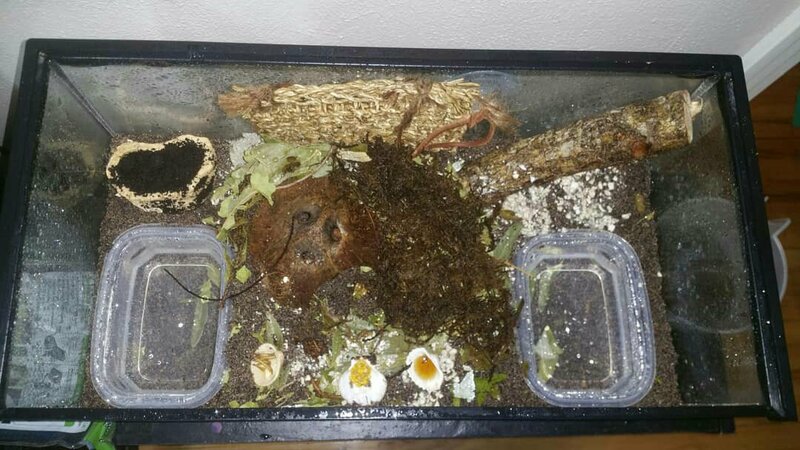 It had a couple of inches of eco earth/sand, damp moss, a shell of honey, shell of bee pollen, shell of chicken, shell of worms, some crushed calcium powder, and two small containers of fresh water and salt water. He stayed there while I was at work. I just finished setting up the 10 gallon ISO. There's a bowl for fresh water, a bowl for salt water, a dish of worm castings, a coconut hide (his favorite), oak bark, a climbing net, and lots of leaf litter. I've added his honey, bee pollen, worms and chicken if he's hungry. The pools don't have bubblers so I'll be doing water changes daily and misting as needed. I also need to order a heater, right now I'm using a heating pad since I had no back up heaters. 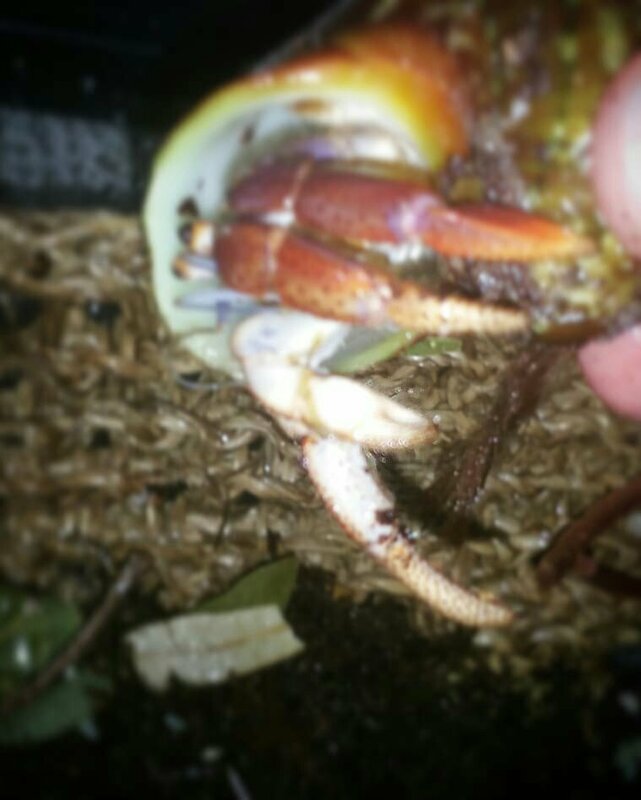 He will stay here until he's healed up, molted a couple of times, and ready to rejoin his siblings! When I was adding him to the 10 gallon, I noticed he started to regrow the pincher already!!! I didn't know it happened that fast! 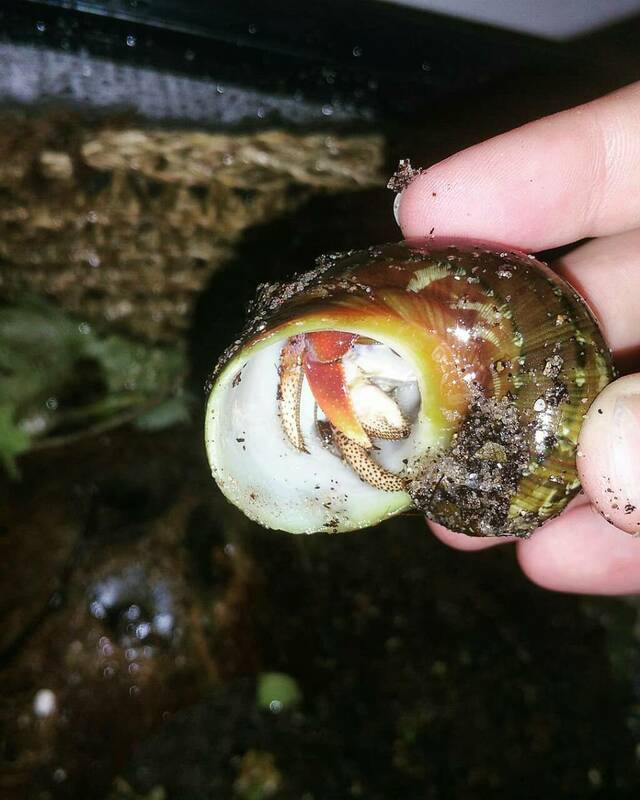 Sebastian was my first hermit crab. I saw him in Biloxi MS while on vacation. He was in a small orange painted shell. He stayed in that shell, in his kritter keeper with gravel rocks as substrate and a small shell of tap water and pellet food with a desk lamp beaming down on him for light and heat for 8 months before I found the HCA. He survived all of that, and has been living luxuriously since the HCA educated me! I'm so upset this has happened, but I think he will pull through. I got him August of 2017, and he's tripled in size since I found the HCA and got his tank conditions right! With all that said, what do y'all think? Did I miss anything??? Should I add or take out anything?? Re: OUT of shell and missing limbs!! 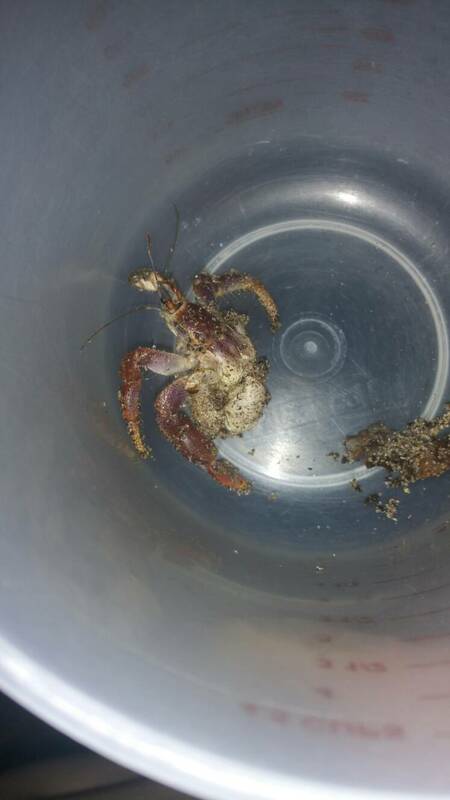 I think you are doing great at providing the proper care for your injured crab and I'm so glad he got back into his shell . The only thing I can think that still might need done is to add some fresh fruit/veggies in the iso tank. ❤ Your crab may be stressed. Do you handle him often? Have enough extra shells in your tank? 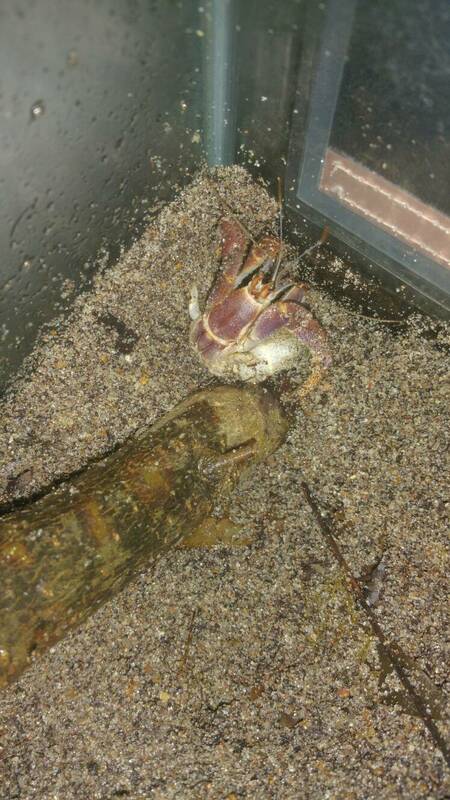 Any observed fighting between crabs? What do your hydrometer and thermometer read? At least he is re-shelled, I would continue to give him high energy foods to help him recover like you have been doing. 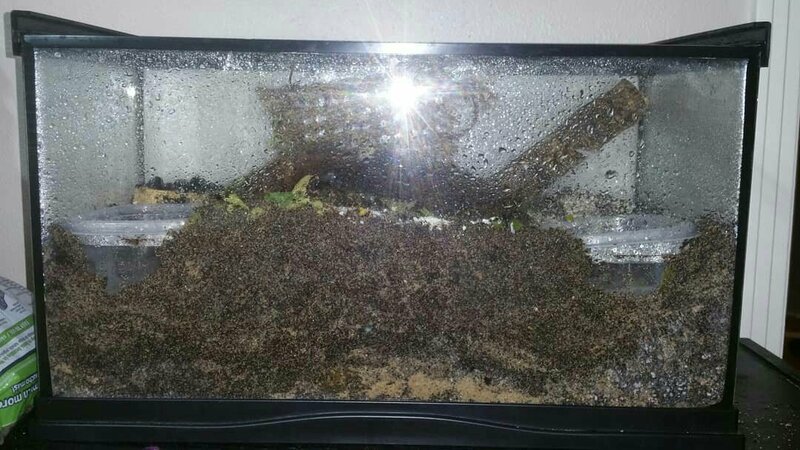 Hopefully he will molt soon and make it through for you. Could it have been a fight over a shell? previde plenty of shells both large and small. isolate the attacker and the crab. DO NOT touch the crab. wait for him to crawl into a peice of paper and scoop him into another tank. then check for mites and orevide appropriate substrate and humidity for all tanks. heat should be from 75-85 degrees and humidity should be at 75-80 percent. if that happens again, i mean. Purplepincher, sometimes it is necessary to gently re-shell a crab by hand. i know. i just wouldnt want to stress it out even more.